1 of 4 Heat oven to 425 degrees . Place cutlets on a baking sheet. Bake at 425 degrees for 12 minutes, turning once. Remove from oven; cool and cut into bite-size pieces. 2 of 4 Meanwhile, bring a large pot of lightly salted water to boiling. Add pasta and cook 12 minutes, or as per package directions. Drain. 3 of 4 Increase oven temp to broil. Melt butter in a medium saucepan over medium heat. Add garlic; cook 1 minute. Whisk in flour; cook 1 minute. Pour in milk, whisking. Bring to a simmer and cook 3 minutes. 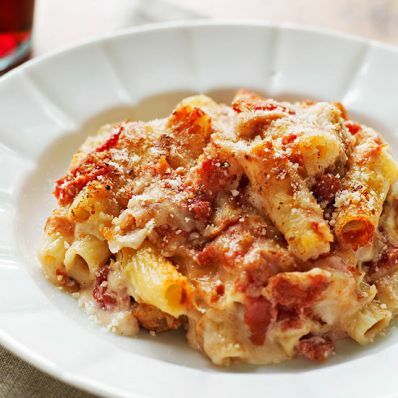 Remove from heat and whisk in 11/4 cups of the Italian-blend cheese and 1/4 cup of the Parmesan. 4 of 4 Stir cheese sauce and tomatoes into pasta. Fold in chicken. Pour into broiler-safe dish. Top with marinara and remaining 1/2 cup Italian-blend cheese and 1/4 cup parmesan. Broil 3 minutes until cheese is lightly browned.